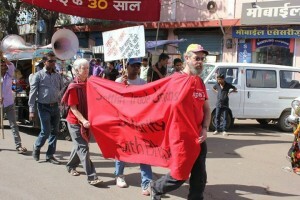 Two of our num­ber in Bhopal. ‘Nev­er give up, oh nev­er give up,’ we sang in the dark Decem­ber evening. ‘Nev­er, nev­er, nev­er, nev­er, nev­er give up’ to the peo­ple still cam­paign­ing for jus­tice and com­pen­sa­tion for the dis­as­trous effects of the Bhopal chem­i­cal leak 30 years ago. Around half a mil­lion peo­ple were exposed to tox­ic fumes in the cen­tral Indi­an city of Bhopal on the night of Decem­ber 2 to 3, 1984. Near­ly 4,000 peo­ple died in the imme­di­ate after­math, and around 10,000 sub­se­quent deaths have been blamed on the dis­as­ter. The 2 com­pa­nies involved have avoid­ed any con­se­quences. They have not even dis­closed what the poi­sons com­prised of so that effec­tive med­ical treat­ment con­tin­ues to elude doc­tors. ‘Stand, oh stand firm’ we sang as the memo­r­i­al can­dles flick­ered for the thou­sands who have died and been dis­abled and impov­er­ished as a result of the greed and rapac­i­ty of cor­po­rate busi­ness. ‘See what we all can do’. ‘Think of me, for­get me not, remem­ber me wher­ev­er you go’ we sang as the wreaths were laid. ‘I am yours and you are mine, remem­ber me wher­ev­er you go’ — in sol­i­dar­i­ty with those still fight­ing for good­ness and truth in the face of mon­u­men­tal wicked­ness. As Pablo Neru­da wrote, ‘To feel the inti­ma­cy of broth­ers is a mar­vel­lous thing in life. To feel the love of peo­ple whom we love is a fire that feeds our life. But to feel the affec­tion that comes from those whom we do not know, from those unknown to us, who are watch­ing over our sleep and soli­tude, over our dan­gers and our weak­ness­es – that is some­thing still greater and more beau­ti­ful because it widens out the bound­aries of our being, and unites all liv­ing things’. I hope we man­aged to send our thoughts as far as Bhopal.